= Velesunio angasi. — Santos-Neto et al. (2016). = Velesunio angasi (G.B. Sowerby II, 1867). — Walker et al. (2014). = Velesunio angasi. — Zieritz et al. (2013). = Velesunio angasi Sowerby, 1867. — Bogan (2010). = Velesunio angasi. — Hoeh et al. (2009). = Velesunio angasi (Sowerby, 1867). — Graf & Cummings (2007). = Velesunio angasi. — Walker et al. (2006). = Velesunio angasi (Sowerby, 1867). — Graf & Cummings (2006). = Velesunio angasi. — Baker et al. (2004). = Velesunio angasi (Sowerby, 1867). — Roe & Hoeh (2003). 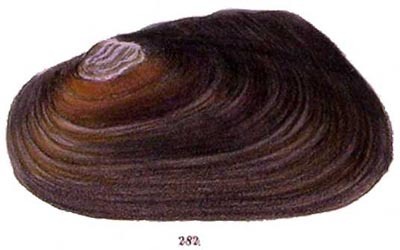 Alasmodon angasana Adams & Angas, 1863. ‘Lea’ Adams & Angas, 1863, Proc. Zool. Soc. London: 418 [nomen nudum]. 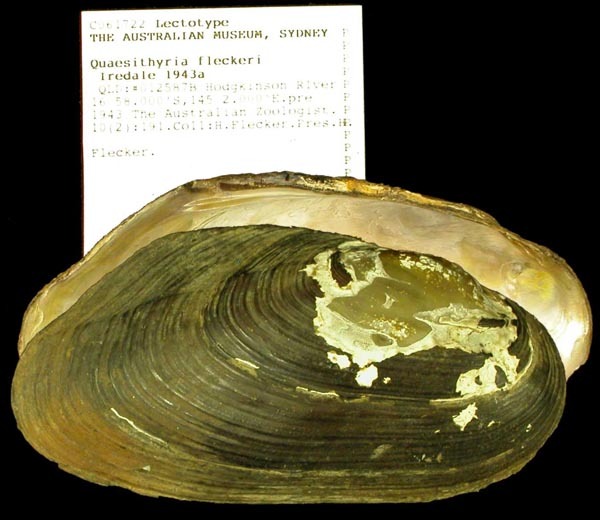 ‘Lea, MS’ Sowerby, 1867, Conch. Icon. : pl. 55, sp. 282. ‘Lea’ Sowerby, 1870, Conch. Icon. : pl. 32, sp. 127 [as ‘Anodon angasii’]. 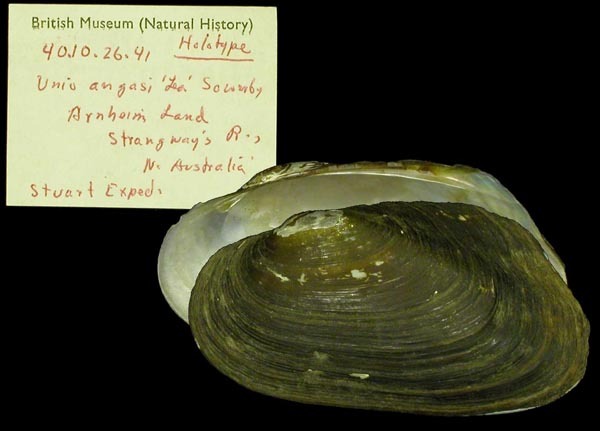 Type(s): HOLOTYPE BMNH_70-10-26-41, Strangways River, Arnheim Land, North Australia. Tate, 1882, Trans. Roy. Soc. S. Australia: 56. 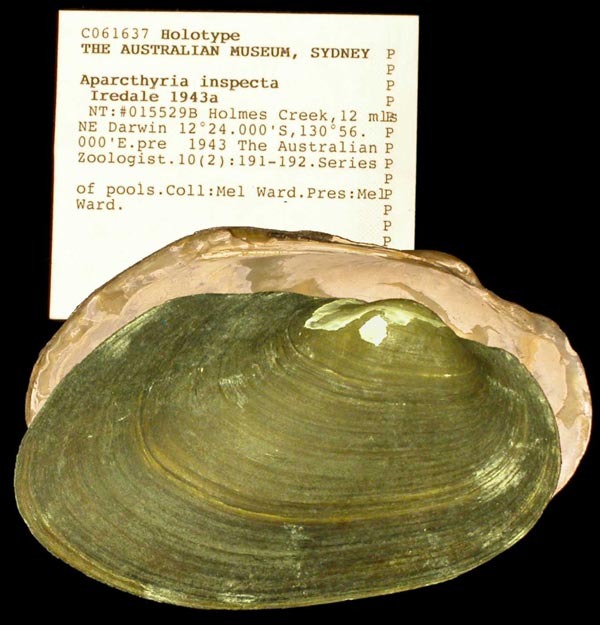 Type(s): HOLOTYPE SAM_D.14427, Adelaide River, at the ford, Northern Territory, Australia. 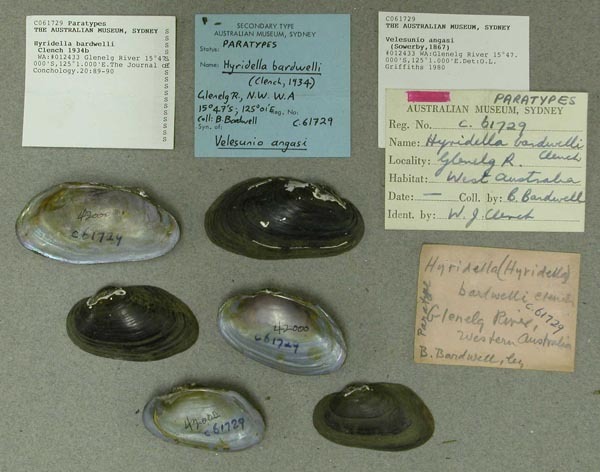 Hyridella (Hyridella) bardwelli Clench, 1934. Clench, 1934, J. of Conch. : 89, pl. 2, figs. 1-5. 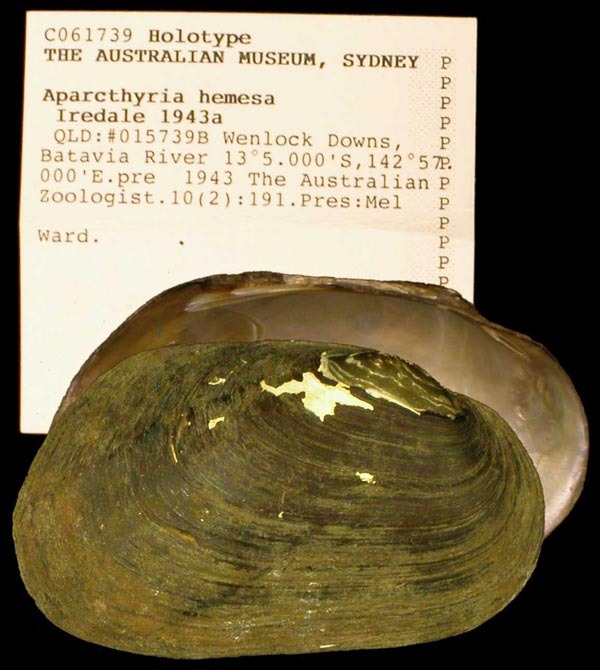 Type(s): PARATYPES AMS_61729, Glenelg River, Western Australia, Australia [-15.783, 125.017 > ± 100 km].